Cutlet is a very popular snack recipe with crispiness outside and softness inside. This yummy snack is accompanied with tomato ketchup or any chutney. There are many variations in cutlet recipe . Like veg cutlet, chicken cutlet, beef cutlet, fish cutlet and many more. Each variety tastes unique in taste and flavor. Here am going to share a beef cutlet recipe with fried beef and mashed potato. Mostly, egg is used while making cutlets. But here i used gram flour or besan instead of egg mixture that makes the perfect cutlet. Beef cutlet is one of the simple recipes for ground beef. Cutlets or potato snack is very common in Indian restaurants , tea stalls as an evening snacks recipe. 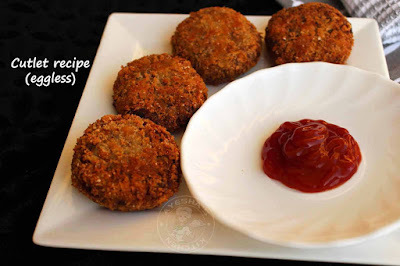 So do follow this recipe showing how to make perfect cutlet without egg. Hope you all love snacks recipes with ground beef and mashed potato. In American cuisine, cutlets are made using chicken which is coated with flour, egg and bread crumbs and then fried in oil. Australians eat lamb cutlets which is battered with egg yolks and bread crumbs. Here the most popular chicken cutlets are known as chicken schnitzel. Both lamb cutlets and chicken schnitzel are staple of Australian children's cuisine. But in Indian cuisine, cutlet refers to spiced cooked meat (chicken, fish, beef, mutton) stuffing that is battered and then fried. But while making vegetarian cutlet, mashed potato is used instead of meat. Do you know what is the purpose behind eating snacks? The ultimate aim of snack is to carry you over to next meal without filling you up but we feel little satisfaction after a snack. Snacks are classified into two main categories namely healthy snacks and fried snacks. Healthy snacks will be high in fiber and low in saturated fat. Your tummy will feel full and satisfied until your next meal. Snacking these healthy snacks are really good when you feel hungry. But it is very hard to eat healthy snacks all the time rather we all go for fried snacks which is my favorite all the time. People like me will even break the fasting because of its inviting aroma. Particularly Indian snacks have an inviting and drooling aroma that makes you hungry. Cutlets , samosa, bhajji, pakoda, fritters are my all time favorites. Snacks are inevitable during the special month of ramadan. During ramadan, especially in malabar region people make different variety of snacks for ifthar. 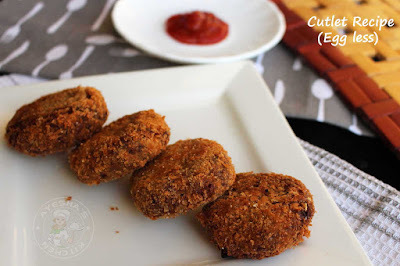 Cutlets are one of the most common snacks among ifthar recipes. So today let us see how to make a beef cutlet recipe without using egg. Do try and enjoy. Wash potatoes well and cut both into halves without peeling the skin. Boil the potatoes with enough water along with some salt. Cook for 10 minutes or until done. When done, drain the excess water. Peel its skin with your hand and mash it with a wooden ladle or any thing like that without any lumps. Set aside. Now make the filling. You can make any fillings of your choice. Here i am going to share the recipe of beef cutlet. You can follow the same recipe for making chicken cutltet and mutton cutlet. So for beef cutlet recipe, i used leftover beef fry as the main ingredient for filling. You can use curried beef, beef pieces from beef roast or even simply cook beef with chili powder, turmeric powder, coriander powder and salt. Pressure cook for 3 whistles without adding water and fry those cooked beef pieces in less oil. When done, shred the beef by pulsing them in a grinder for a second (be careful, do not grind them). For the filling, heat 2 tbsp of oil and saute the onion, green chilies until light and golden. Then add, shredded beef and saute very well. Now add mashed potato and give a fine mix. Check for salt. Now make medium sized balls out of the potato beef mixture. Slightly flatten on the top. Dip in the gram flour batter and coat with bread crumbs. Now heat oil for deep frying. Deep fry this cutlet over a medium flame until brown on both sides. 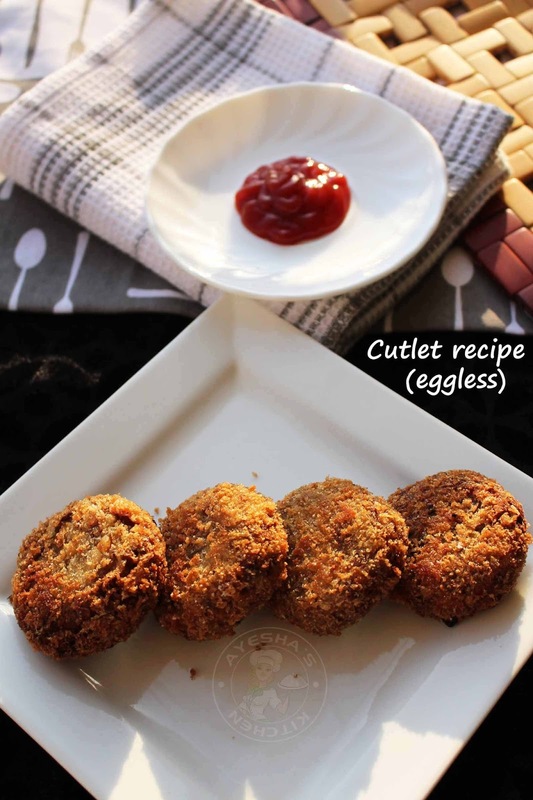 You can also shallow fry these cutlets instead of deep frying. Drain it to a paper towel. Serve along with tomato ketchup or green chutney.